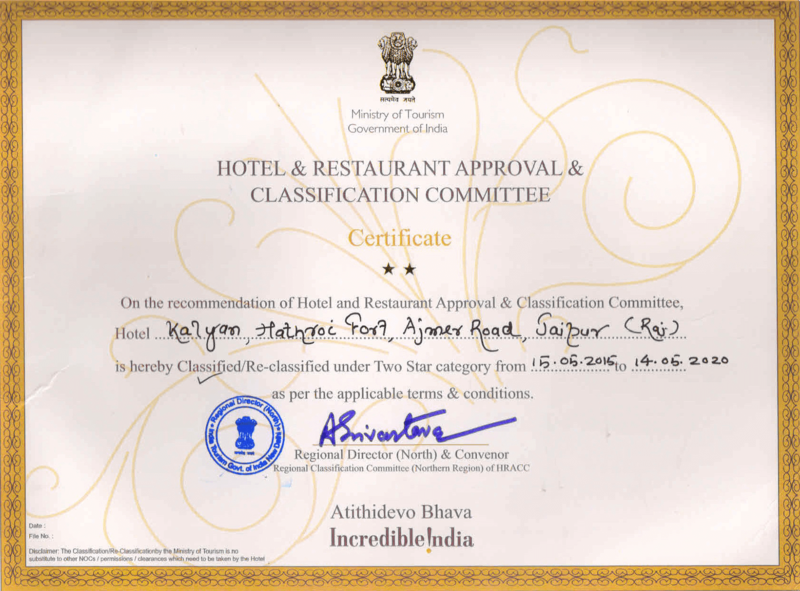 Client Testimonials - Reviews and feedback of Hotel Kalyan. Wow! stayed here Sept. 2013. what a fantastic place!! The rooms, with powerful fan and AC, are very spacious and clean with large beds, comfortable mattresses and pillows and new and freshly laundered sheets. The en-suite bathrooms have hot water showers, large sinks and western or Indian style toilet, your choice. Large bolt on door with spy hole and for extra feeling of safety there is CCTV in all public areas and 24 hour front desk managers. Very Safe for everyone, all ages including older women/men or women travelling alone. There is a fully operational elevator/lift to all floors and to the rooftop restaurant, so it is perfect for disabled or older people, and very safe for children.The restaurant has a fabulous view of the fort and city beyond. 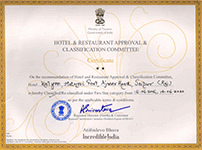 The food is excellent with a large variety of North and South Indian dishes, and good choice of western food also, with 4 cooks/chefs. All vegetables and fruit are bought fresh daily and washed in boiled water. Ice is available made with bottled water.All soft drinks and beer are served very cold. The service is fast and the staff always get the order right. They will make your food spicy or non-spicy, as you wish. The rooftop restaurant also has a wide variety of plants and flowers growing, which are very well looked after,giving a fresh garden feel, and there is a covered area to provide shade in the daytime. At night there is a cool gentle breeze and fresh clean air. The owners and staff are very friendly, attentive and speak good English. The hotel is set one street back from the main road, so is quiet and peaceful but only a short walking distance to local shops. and for 50 rupees you can take a rickshaw ride to the famous sights, shops and banks, or take a relaxing massage or a spa/swim nearby. The hotel is only 25 mins from the airport, (pre-paid taxi is 400 Rupees/£4/$6) and is 1Km from bus and train station. I can totally recommend this hotel, great accommodation, food and service at a very low price. Everything can be arranged for you, nothing is too much trouble, I will always stay here when I visit Jaipur, my experience was made wonderfully pleasant, easy and memorable, my face was aching from smiling and laughing! Come for the food stay for the hospitality. I am so grateful that my boyfriend and I came across this restaurant at the top of the Kalyan Hotel. We are so thankful and grateful for the advice and help the owners and their son gave us. These people are truly ethical, and they helped make sure we were treated as guests as opposed to tourists. We came to the Kalyan Restaurant after a disastrous day shopping. Our hotel (in the area) offered no advice about where to go, and we ended up being having our tuk tuk driver try to take us to all commission based and overpriced shops. We were looking for a restaurant after our day, and found the Kalyan Restaurant on tripadvisor. We took the elevator up to the roof, and our first impressions were that the rooftop is charming and relaxing. We sat down and before we even ordered the owner stopped by to say “Hello”! We ordered the Thali and some beers, and sat back and enjoyed our surroundings. The atmosphere and the food both ended up being wonderful, but what set this place apart was the help we got from the owner and her family. We mentioned to the owners son we were attending a wedding in India and were trying to go shopping. He told us immediately not to have the tuk tuk drivers take us shopping, but we told him we were too late. I really wish our hotel would have cared to tell us this, as we would have avoided a very annoying day. They then recommended some great places where we could go shopping, and not be treated like cash cow tourists. I really appreciated this. The fact that these people look out for you, and try to make it so you do not get taken advantage of is very refreshing. While we were talking with them, we got the impression that these were really ethical and caring people. We liked them so much we actually booked our car from Jaipur to Pushkar with them instead of our hotel! They ended up giving us a price 700 rupees less than our hotel, and the service was flawless. We even left with the phone number of the owner, her husband, and their son in case anything went wrong. I highly recommend stopping by this restaurant to enjoy the wonderful ambiance of the roof, the food, and the great advice the owners provide. Again, a HUGE thank you to the owners for watching out for us! This food was so tasty and a great price!! The staff were kind and attentive. The tandoori aloo was the best meal I have had!! The cheese is made daily in house and is to die for!!! If you have been travelling as long as we have you will miss and appreciate a good cheese.. Look no further!!!!! Delhi belly? Won’t get it here. The food here is soooo good. Indian breakfast? Spot on. American lunch? On par. Chinese dinner? Amazing. The owner is an amazingly sweet woman, her daughter is so smart and so charming and her son also works here and is so nice. I am so impressed with this place! I wish I could stay longer… They make you feel like family. When traveling in a country where you are constantly worried about the food and water making you sick. Being able to eat at an amazing restaurant where you know the food and water are clean is a refreshing experience. My friend and I stayed at the Hotel Kalyan, where the restaurant is located for 6 days. Every day was a new culinary experience into traditional Indian food (breakfast and dinner). Each day our bellies were filled with the most amazing food with fantastic service. High above the streets of Jaipur, the noises fade away and soft conversation is able to be had morning and night while sipping tea, coffee or even a beer. Whether you are staying at the hotel or not, stopping for a well priced meal at Kaylan Restaurant is a must while in Jaipur. Firstly, the roof top restaurant is a great place to chill out, chat and watch the sunset. The food was excellent, I really recommend the vegetable rice and the Thali, both were excellent. They have a very extensive menu, which for some restaurants is their downfall; however, here, it was excellent. The Masala Dosa was also great for somewhere up north! I really enjoyed trying the different food sortiments at this restaurant. I was impressed by their wide range – the serve also dishes specific for other regions, not only for Rajasthan. And if you would rather stick to what you know, you can also between some European dishes. My only observation is that a toilet near the terrace would be great, so that you wouldn’t have to go to your room. I and my wife stayed here for one day. When we reached Jaipur, I just called the Hotel to get directions on how to reach the place. They kindly arranged a car to pick us from Jaipur Station, First, the location of the hotel is perfect! Close to the train station and to many other sightseeing points. The hotel is decorated with traditional rajasthani handicrafts that gives the place an exceptional flavor, Rooms are very neat & clean Quick Room Services interior very good hi speed wi-fi connectivity. They had arranged a car for a local tour of Jaipur at a very reasonable rate. Perfect for travellers on a budget. We stayed at Kalyan for one night during our stay in Jaipur. The family who owns this hotel is friendly and welcoming and does everything they can to make you feel at home. They are very knowledgeable about Jaipur and can help arrange anything you want to do. The rooms are spacious and clean, the bathroom has warm water and a shower with good water pressure and the bed is comfy. On top of all this,food was superb at roof top restaurant, service was very fast. Highly recommend! L’Hotel Kalyân si trova in una stradina tranquilla non lontano dalla stazione ferroviaria e dei bus e la Pink city si raggiunge in pochi minuti in tuc tuc. E’ ideale sia per brevi o lunghi periodi e vi troverete come a casa grazie alla proprietaria, la signora Vinita Gupta e a suo figlio Bhuvnesh, sempre disponibili a aiutare e condividere informazioni preziose. Sull’ampia terrazza verdeggiante potrete anche assaggiare dell’ottimo cibo; il menu propone sia cucina indiana vegetariana che piatti internazionali(pizza e pasta). Da qualche giorno sono stati installati sulla terrazza dei nebulizzatori, che vengono accesi la sera e rendono l’ora della cena più piacevole. In sintesi: ottimo per posizione, pulizia, menu, servizio e accoglienza. Though i stayed here only for one night i certainly feel like staying more. I loved the hospitality, friendly behavior of all the staff and owner’s personal care for all her guests. i loved spending time with her. This will be the only hotel i shall prefer to stay whenever i visit Jaipur next and surely recommend all my friends and family. it was certainly a homely stay. I truly thank them for their service. We will be back .,,! !